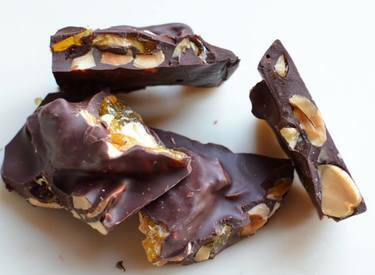 If you have never had a Marcona Almond, this recipe is just the excuse to try some. They are a Spanish import, sautéed in olive oil and sprinkled with sea salt. I love to include a handful of Marcona Almonds on cheese boards. Manchego is particularly good served with the almonds. Bittersweet chocolate is just right with the crunchy, salt/sweet almonds tucked inside. Mmmmm…seriously good. Happy National Bittersweet Chocolate with Almonds Day!